Harvest Season may have come to a close and the cold weather may be right around the corner in the Finger Lakes, but that doesn’t mean the fun stops at Treleaven! When you begin to look for a way to fight cabin fever during those chilly days, grab your friends and family and head to the winery - a short 25 minutes drive south of Auburn. You can still visit for regular tastings and tours, but if you’re looking for something a little special, we’re offering fun (warm) winter activities that offer a change of scene closer to home! 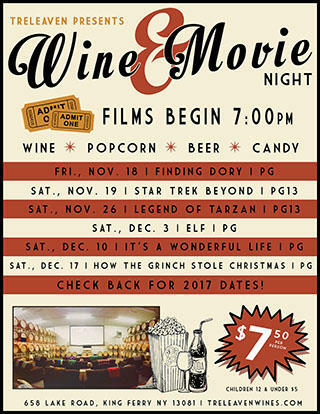 Bring a blanket and sip on delicious wine or beer while enjoying the evening’s feature film in our barrel room turned movie theatre - we promise you no previews and all the wine you can drink! The season will feature four Friday flicks, and seven Saturday showings. The schedule begins on Friday, November 18 featuring Finding Dory, and continues every Saturday through December 17. After a two-week hiatus to celebrate the holidays, the event will resume on Friday, January 6. There will be six showings in the New Year, including three Friday evenings. General admission is $7.50, with children 12 and under admitted for $5. Concessions, wine and beer will be available for purchase. The winery will welcome guests for tastings until 6:45PM, and the feature film will follow with a start time of 7PM. Looking for a fun, unique venue to watch football in the Finger Lakes? 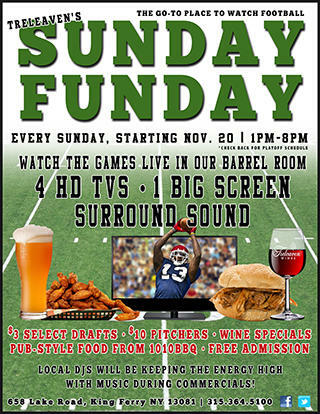 Look no further than Treleaven, where you can cheer on your favorite team at the winery’s barrel room turned sports bar! Everything you could want while watching the day’s games will be a short drive from Auburn and Ithaca. The Treleaven barrel room will be equipped with four 55” high-definition televisions, as well as a large 16x9 projector screen with surround sound that will display the most anticipated regular season game at 1pm and 4pm. There will be multiple seating options available including comfortable couches and high-top tables. The football-filled days will feature local DJs keeping the atmosphere fun as they play music during the commercial breaks. Local favorite 1010BBQ will be serving pub-style food, and Treleaven will supply the beverages. There will be more to offer than just wine - local craft beer and domestic brews will be on tap, and non-alcoholic beverages will be available. There will be plenty of seating, friendly service and of course, a great atmosphere! Jersey or no jersey, all are welcome to join us cheer on your favorite team at Treleaven! For more information on the winter activities at Treleaven please call 315.364.5100 or email info@treleavenwines.com.